Two weeks ago, my best friend and now fiancé, took me on a journey I will never forget. In fact, to ensure I did not forget, he had photographer, Barbara Clarke, join us for every step of the way. Not only is she an amazing photographer, but she felt like family and she helped make this an unforgettable start to the rest of our lives. The story begins with a wager we had at work. Keegan and I have been dating for 12 years (on and off), so it is no surprise that my colleagues were ready to place bets on when the engagement would happen. I wouldn’t have been able to offer any clues if it weren’t for my mother’s newfound interest in my manicure schedule. That being said, the week of June 6th, I was nervously preparing for a family trip to Nantucket; I was concerned that if it did happen, I would obviously need the perfect outfit! However, Keegan threw me off his trail by picking a big fight with me in front of our family friends. Frustrated and confused by Keegan’s strange behavior, I prepared for a family dinner on Saturday night. We were going to the Galley, which has the most stunning sunsets so I was still angry with Keegan but also excited to get great blog photos!! When we got the airport, my Dad and Keegan went to retrieve the package. While they were inside, my Mom showed me her phone and said, “did you see that picture Keegan sent us?”. Confused, I took her phone only to find a picture of The Lady and the Tramp with the words, "This chapter starts with a trip back to where our story began…” written across the photo. Growing up, The Lady and the Tramp was our favorite movie and Keegan used to call me "Lady". It took me three tries to finally understand that what I had been waiting for since I was 15 was about to happen. I started crying and asked “Am I supposed to get out of the car?” My brother laughed, and yelled, “Yes, get out of the f***ing car! !” I met Keegan at the entrance to the airport where he was holding out his hand. He took my hand in his and guided me to the airplane. Once we got up into the air he handed me a note that said "Whiskey Girl", which was our childhood song. With tears streaming down my face, he pulled out a tiny bottle of Jack Daniels and said “Cheers to our next journey together”. We landed in Martha’s Vineyard and were met by a car service which took us off the beaten path and through winding dirt roads. As we drove, I became more and more confused. Our “Journey” did not begin in Martha’s Vineyard. For those of you who don't know us, our story began at a party in our friend's basement. I was in private school and my best friend went to the public school in our town. She had taken me out to one of her parties...with older boys. At 15, I was both excited and terrified. We had been there since 8 and we were quickly approaching my midnight curfew when in walked Keegan. Apparently I have no poker face because my friend looked directly at me, pointed to the bathroom and said, "I have to go to the bathroom, don't you have to go too?" With that, her eyes widened with urgency. Our telepathy was on point, she didn't need to be dramatic, but I begrudgingly followed her to the bathroom anyway. Once we made it to the bathroom she grabbed my arms and said, "I saw the way you looked at him. As your best friend, I have to protect you. He only goes for older, blonde hair, blue eyed, athletic girls. He doesn't even talk to the younger girls!" I had one out of four of those qualities, so I had a chance, right!? Being shy and awkward, my disillusions of my chances didn't help me when I finally "confronted him" In fact, I walked right up to him and just stood there until he spoke to me. I am sure he was confused and I do not know why he engaged me in conversation, but he asked if I wanted a beer. That broke the ice and we got to talking until my phone rang. It was my babysitter. She had called to tell me my curfew had come and gone and I needed to get home, now. This was a tough situation for me considering my babysitter was my Spanish teacher, but I negotiated anyway. At 15, my version of negotiation was really just honesty and unsupported declarations. I told her I met a guy and he could be the one so she had to give one more hour. Thank you Mrs. Bartone for that extra hour! After I finished my negotiations, Keegan asked for my number, which I wrote down his arm (don't ask me why) and then took me and my friend home, just in time for our newly appointed 1:00 curfew. Now that you know that story, you can understand why driving around Martha's Vineyard's dirt roads, didn't spark me as "the beginning" but I went along with it anyway. After driving for what felt like 20 minutes, we pulled up to a gate that said "Private Property, No Trespassing". Keegan turned to me and said “this is where we get out". I diligently got out and we walked down a dirt path to a pier, at the end of the pier he said, “Take off your shoes”. Again, I diligently took off my shoes and followed him down the beach. We walked along the beach until we reached another pier. When we made it to the edge of the pier he said “do you know where we are?” I had absolutely NO idea!!!! As I stared at him, bewildered, he said, “12 years ago, we had only been dating for a month but your parents invited me to Martha’s Vineyard with them. That Saturday, we all went to the beach, but you and I separated for a bit to go for a walk. In fact, we walked to the edge of this very pier. Do you remember what we did?” Embarrassed and excited, I said “no” again!! Keegan laughed and reminded me, “we carved our names onto the pier”.... all of a sudden I remembered the whole thing, how I felt, how knots filled my stomach, how sweaty I was just having him next to me, how nervous I was to have this gorgeous, older guy on a trip with me and of course, how perfect it felt. How could someone I just met, at fifteen, feel SO right?? Tears started STREAMING down my face and my stomach cramped up the same way it used to when I was fifteen and I would see his name on my caller ID, or when his Jeep Cherokee would pull into my parents drive way, or when I would catch his gaze from across the room at a party. 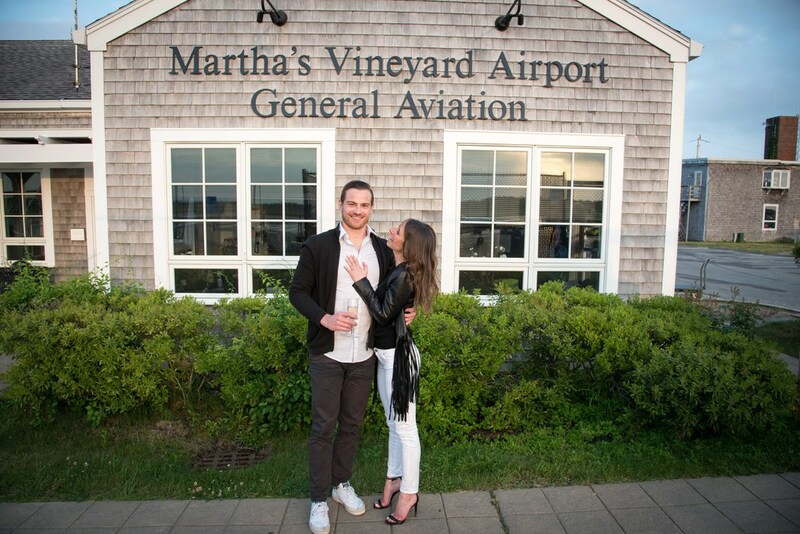 Of course I said YES and then we got back in the car, popped the champagne and flew home to Nantucket where my family met us on the runway to celebrate. If you know me, you know I have spent my entire life picturing and planning my future. Stupidly, and to my own dismay, I have expected and planned every moment to mimic my favorite RomComs – because who wouldn’t want the Notebook love affair?? But I was always disappointed when life didn't happen like Nicholas Sparks wrote it. However, this engagement was better than I could have planned or Rachel McAdams could have starred in! Because Barbara Clarke did such an incredible job and because I can’t choose, I’ve added photos from the engagement below!